In the meantime, I’ll go ahead and get myself ready for the day that I can finally fill my front porch with flowers by choosing the planters that I want to use this year. I especially love to mix multiple styles and sizes of planters together in a group! 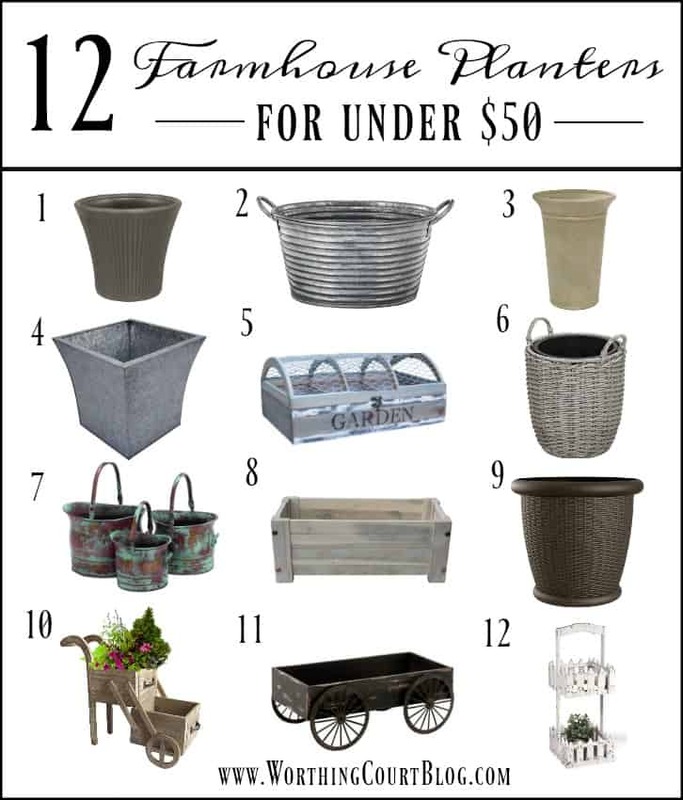 I’ve rounded up a great selection of farmhouse style planters for under $50. Each one is rated for outdoor use, but some of them are only for covered or protected areas, so be sure to read the description. CLICK ON THE LINKS BELOW THE IMAGE THAT CORRESPOND TO THE NUMBERED PLANTERS. When do you feel safe, weather wise, to start filling your outdoor containers where you live? LOVE the copper metal baskets!!!!! Will certainly look in to those! Thanks! Thanks for the planter suggestions. I bought one very similar to #5 at JoAnn’s. It was listed at $29.00 and was 40% off, so I got it at a steal! Last one on the shelf! Like you, I’m very anxious to start filling containers. I have ordered the new “Phenomenal” Lavender, and am going to try to grow it in a container this year, as I have read that Lavender can be taken inside and will do well over winter, if kept in a sunny window. I’ve never had much luck overwintering lavender outside in our Zone 4 winters, so I’m going to try this. A good selection – love the copper. I use this old copper pot and it has a verdigris finish. I don’t have to worry about winter in S. FL. Looking at my potted elephant ear now. I usually have plants out by the first of April – not a big risk in Texas ?. Thanks for the planter ideas. Iam in an area for another month where all the flowers are in bloom. The azelias are beautiful because of an unusually warm winter. It will be hard to go back to the Midwest ! I liked the variety of planters. It makes you feel like spring may show up. Yes I can’t wait either! Frost date in Middle Tennessee is April 17. Sometimes that is not safe. Crazy Mid Tn weather! Love number 5 and we have huge galvanized tub out by our shed that I aged with Lysol toilet bowl cleaner. I love the patina of the copper metal pots although all are nice! I love #8. I’m in North Florida and we haven’t really had any winter this year. Everything is already blooming and I’m off to buy some flowers to plant. Thanks for all the great planter containers. Thanks for the links, Suzy. Usually, because I’m in So Cal, we can do this anytime. However, it has been quite cold lately, hitting in the high 40s… I know, I know, but it’s all relative! In NC and we saw frost this weekend! The hyacinths at my mothers home all were frozen. So sad! I’m holding off on flowers. It’s too early here!! Love the planters. Looking forward to warmer days to get planting. Those are all so cute. Thanks so much for providing the links. I am loving galvanized planters right now. They look so pretty on my front porch. Perfect timing for this we are picking out our outside flowers this weekend. Now to choose which to choose! Suzy, Thanks for the great selection of planters, along with the links. Love the copper metal planters. Going to Lowes today to purchase them. Can’t wait to start planting. I love the double tiered plant cart. That is so cute. I have an antique bicycle planter that I love. Thanks for the ideas! Hard to choose which one I like the most. Thanks for all the potting container suggestions. Especially like number 5. I am in central Florida so we are experiencing nice weather so I am ready to start planting. I love your choices. I saw several that would fit my taste. I am looking to start planting some herbs on my screened in porch. Thought the copper would be cute for that. I like the rustic look on #5 for an idea for some herbs too. Thanks for sharing! I love your blog! Looks like I’ll be making a trip to Lowe’s real soon. LOVE the copper bucket trio! I think I love almost all of these but, the galvanized and the copper have to be my favorites!